This basic ginger tea recipe is so simple to make! Using the fresh root and a cup or two of water, it can be made in just minutes. It can be drunk as it is, and is very tasty, but if you do have a sweet tooth feel free to add a drop of honey, or as I prefer, some agave nectar. For a slight variation of this spiced tea click here. 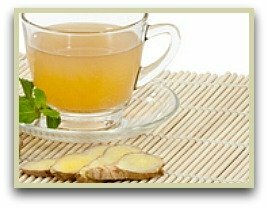 And for another using the fresh root with cinnamon and lemon you may enjoy this recipe for ginger root tea. Add the water and sliced or grated root to a saucepan and bring to the boil. Turn down the heat and simmer for 3-4 minutes. Turn off the heat and let sit for another few minutes. Sweeten if needed and enjoy! Add honey and lemon, and it can help ease the symptoms of colds and flu. And traditionally, it's long been used as a cure for upset stomachs and heartburn. For centuries, and still to this day, sailors and fishermen in the Far East used it to prevent against sea sickness. Interestingly, the popular TV show Mythbusters tested its effectiveness against seasickness and found it to be true. Click here to read more on the many health benefits of this tasty spice! Recipe For Turmeric Tea - Very potent and probably the healthiest spice known!